When you plug in your laptop at home so you can surf the Web, you most likely have fossil fuels to thank. However, this could change in the near future. Your home may one day be powered by unwanted carbon dioxide. The current electricity market in the United States relies heavily on fossil fuels. In 2012, about 67 percent of the electricity generated in the United States was derived from either coal or natural gas. Renewable energies made up about 12 percent of electricity, according to the U.S. Energy Information Administration. If you break down the sources of renewable energy, you’ll find what’s called geothermal energy, which made up about 3 percent of total electricity generation that year. The U.S. is actually the world’s leader in geothermal energy use, with plants mostly in California and Nevada, according to Geothermal Energy Association’s 2012 annual report. 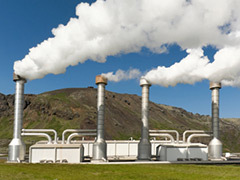 Conventional geothermal plants create energy from the heat off water deep underground. However, researchers from University of Minnesota, Lawrence Livermore National Laboratory and Ohio State University have recently come up with a geothermal plant design that could use unwanted carbon dioxide in place of hot water to create electricity. There are several potential benefits to this approach. For one, carbon dioxide extracts heat more efficiently, and the entire approach is twice as efficient, according to an article posted on Science Daily. Another benefit? We could start seeing more geothermal plants in states west of the Mississippi River. In addition, the researchers believe that energy created through this type of geothermal plant could be stored for days, or even months, for later use when the electricity grid needs it. "What makes this concept transformational is that we can deliver renewable energy to customers when it is needed, rather than when the wind happens to be blowing, or when spring thaw causes the greatest runoff," said geoscientist Tom Buscheck. Posted on December 16th under Renewable Energy Sources.